Huskie is one of those people you wish everyone could meet. 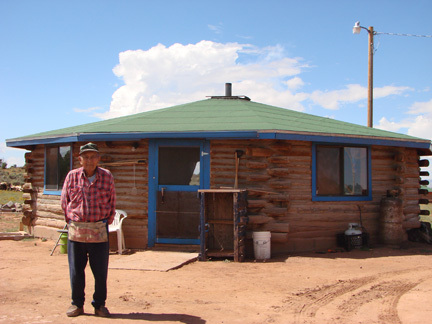 He lives in a contemporary Hogan in the Spider Rock community, through a maze of rutted out dirt ways several miles off the Canyon de Chelly road. Huskie is 80 years old. He has no transportation. He still cooks for himself but on the day we visited, he had no food that he could eat. Three years ago, Huskie had dental problems, so his teeth were extracted; he is still waiting for his dentures through the Indian Health Service. Huskie is also diabetic and needs appropriate foods. “My life hasn’t worked out so well. I’ve been through a lot of things. Situations like this are common in NRC’s service area. These are the conditions that most Americans never see. They are not visible by driving through a reservation. We share Huskie’s biggest worry… “that things won’t be any better for his grandchildren than they were for his generation.” Many grandparents like Huskie are raising their grandchildren. NRC wants vulnerable Native Americans to be remembered and to know that they matter to other Americans. Many of NRC’s services are focused on nutrition, health care, emergency services, and/or education for Native American Elders and youth on poverty-stricken reservations. This entry was posted in Humanitarian, Programs and tagged American Indian elders, Indian Health Service, Native American, nutrition, poverty. Bookmark the permalink. Post a comment or leave a trackback: Trackback URL. if there is any race of people that need to be treated fare and with respect it is the Native Americans. I don’t care who you are these people live in the worse poverty ever and no one cares they are out of sight and out of mind I’m not talking about the big Casinos and what they get. The people on the reservations that you can not see and never read about are totally forgotten. This county has made concessions for a number of races, but the one who was here before any of us is forgotten. And Obama wants to give all sorts of free benefits to illegal aliens – our Native Americans should have prior considerations! I wish that I could be there for Huskie. Our government lied to our natives then and still are now. Let's give them the respect and care that they deserve. Yep! We have a pretty sad history as Native Americans and Alaska Natives in this great country of ours. Out of sight; out of mind. I am glad I found this blog exists today. DOYaxshin! (Thank you in Tsimshian). Millie, do you believe your ancestors were born upon this land? Too many Native Americans are on the offensive, Ms. Slaton was saying something good, and you twisted it. We all must get passed the prejudices and hatred that has been brought forth if we are to survive as America. We need to stop making every little thing a problem and instead work toward fixing the existing problems! And, Millie, do you ever look at the members of many of the Native American tribes? The native blood is running quite thin and if I saw some them, even on their lands, I would not think they are of Indian blood. I 'look' more indian than they do! So, maybe, just maybe, Ms Slaton has a bit of native in her too.